Sociologist and college professor Theresa Morris claims in her introduction (and throughout her excellent new book) that she does not blame maternity health care providers for sky-rocketing cesarean section rates in the U.S. However, this claim rings hollow when you read actual quotes from maternity providers who share that they can talk any woman into a cesarean surgery. In addition, two of the organizations that Morris does blame – hospital protocol-creating committees and ACOG (the American College of Obstetricians and Gynecologists) – are largely made up of maternity care providers. 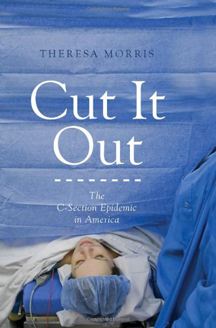 Nonetheless, Cut It Out is a compelling examination of the risks associated with cesarean surgery, the reasons for the rise in the cesarean surgery rate, and solutions to address the problem. For me, the key takeaway from this book is that pregnant women do not know that cesarean surgery is associated with increased risks for both mother and baby. Instead, they too often are told that cesarean surgery is the safest “option” by caregivers who feel forced to choose reducing liability exposure over the welfare of the mother and baby. Morris does a good job of explaining the unfair assumption that all bad outcomes are caused by malpractice and the financial and emotional repercussions of malpractice lawsuits from the maternity care provider’s point of view. But she also highlights the paradox that although some hospitals, insurance companies, and many health care providers believe that more cesarean sections are the appropriate response to the malpractice crisis, that more cesarean sections are actually driving up maternal mortality. Morris does an excellent job of providing extensive references for the information that she includes. Quotes from postpartum women and maternity caregivers (with names changed to protect their identities) interviewed both by herself and her college students help to drive home her points. As life-threatening complications from primary and especially repeat cesareans continue to climb due to an almost 33% cesarean rate and underutilization of VBAC, we, as a society, must address the cesarean epidemic. The first solution that Morris lists under “Immediate Solutions for Women Who Plan to Give Birth” is that “women should take independent childbirth education classes.” We (childbirth educators) need to make sure that women have the information they need to make informed decisions about cesarean surgery and about common interventions that increase the risk for cesarean surgery. We can make a difference, but we need to stay update-to-date with valuable resources such as this book.